I picked up Mitchell Morris’s The Persistence of Sentiment from the new Foyles the other day. Subtitled Display and Feeling in Popular Music of the 1970s, it’s a book about some of those artists and genres of 1970s pop that have devoted followings but not critical respect; that are guilty pleasures, so to speak, even for many who do like them. This kind of discussion is right up my street. Soft soul and disco are both discussed in the context of Barry White (and to a lesser extent Barry Manilow), as is the music of the Carpenters. Soft soul and disco are long-standing favourites of mine, and Karen Carpenter is, I think, one of the greatest singers we’ve had in the recorded-music era. The best feature of modern critical discourse around music is that having had the chance easily to get hold of any music they want – by means legal and illegal – modern rock critics are very catholic in their listening, open to anything. As a young lad, I welcomed a gatekeeper telling me that, say, Steely Dan were awful. It meant that I didn’t need to spend my own money to find that out (only later did I find out how 180-degrees wrong that assessment was and that having gatekeepers dictate what art you should or shouldn’t consume is fundamentally problematic). So while I might argue the extent to which, say, the Carpenters are still seen as kitsch or as a guilty pleasure by anybody, there was no way I wasn’t going to buy this book once I picked it up off the shelf. 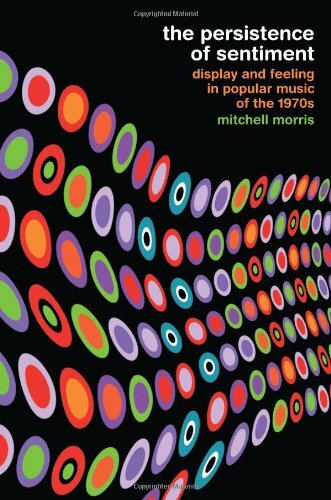 Morris is an associate professor of musicology at the University of California, so his book is understandably strong on the formal analysis of his subjects’ work (you don’t get notation transcriptions of the music being discussed in much mainstream pop criticism), but what’s most impressive is the multi-disciplinary nature of Morris’s approach. He’s alive to the intersection of music and history, and how it was lived by different segments of the record-buying audience (his analysis of the social and political contexts of this music in the introductory chapter is wide-ranging and very astute), and he’s at home deploying the terminology of literary as well as musical analysis. Letting my biases out into the open for a second, this is the kind of music criticism we need. It’s a shame that this is being marketed expressly as an academic work and isn’t going to make it into the average high-street Waterstones. I’m particularly grateful to Morris for giving us a useful term to deploy in my own work. Discussing the differences between symphonic music, opera, art song and the other kinds of ‘high’ music of the European classical tradition on the one hand and pop song on the other, he uses the term ‘modest songs’ as a blanket term for the pop songs of the recorded-music era and the folk and parlour songs of the 19th century and earlier. It’s a term he uses in a purely descriptive way, not as a value judgement. We have rarely known how to account for music that loves the quotidian because our methods have been based on aesthetic and moral preferences for the extraordinary, the original and the convention-breaking inspiration. Our commitment as music scholars have been the strongest, historically, to music that was never meant to be heard every day… The heroic gestures that fill out most of the “great works” in virtually any kind of canon are the ones that modest songs usually refuse – they must forgo too much “greatness” if they are to accomplish their principal goal of living with us instead of living against us in moral-aesthetic agon. Morris articulates this more clearly than anyone I’ve ever read, and my sympathies tend always to lie with critics who treat all kinds of art just the same, who recognise no artificial “high” or “low” distinctions between works. I haven’t finished The Persistence of Sentiment yet, but what I’ve read so far is pretty extraordinary. This entry was posted in Music and tagged 1970s, Barry Manilow, Barry White, guilty pleasures, high and low, Karen Carpenter, Mitchell Morris, modest songs, multi-disciplinary criticism, musicology, seventies music, soft soul, that seventies sound, The Carpenters, The Persistence of Sentiment: Display and Feeling in Popular Music of the 1970s, Univeristy of California on July 12, 2014 by rossjpalmer.